Well it looks like I've got quite a few books to find and add to my collection! I've actually looked through the book on the sorber collection, actually that's where i saw many of the examples i mentioned before. mtmetal, that's pretty fantastic work! and very faithful to the originals to boot. I've wondered what the flame height/etc. was supposed to look like in practice. I never even gave a thought that The "candle socket" on the rushlight might actually be a snuffer, though it does make quite a bit of sense, it'd be a bad idea in a finished home to go blowing melted grease and ash around when its time to put out the light afterall. One of the intriguing things about grease/oil lamps is that their fuel isn't by itself flammable (unlike the aforementioned cornchips!) And without a wick its pretty safe, albeit messy, in the case of it being dropped or tipped over. F. Turley: I've actually seen one of those forms in a swage block before, something said it was for making ladles, but it was actually a lamp form. The point was far deeper and longer than would be practical for a ladle mould. Had i known about those type of lamps years ago, id have carved such a depression into my swageblock form before i had it cast! 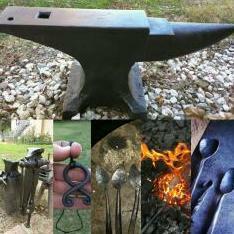 Itd simplify both crussie making and making lead ladles as well! Thanks everyone for the amazing wealth of information on the subject, I've learned more from this post than i have from untold amounts of time searching the web. wow! thank you for that information, for some reason i always thought there was more too it than that! Might have to try my hand at making a couple to make those rush holders in the corner seem like they're actually going to be put to use! Rushlights are pretty interesting, hardly anyone knows about them as classical lighting implements these days. everyone thinks all they had were candles but really rushlights and oil lamps were surely quite a bit more common. I've actually noticed that most rushlights have a provision on the moving arm for holding a candle. Though many I've seen have also had just a welded ball as weight. Hwoolridge i actually have that book (only book i ever spent.over a hundred bucks on actually!) And i use it as a go-to for hinges, latches, and the like but there's hardly any household items beyond door/structure hardware. Thomas, that's the kind of thing I'm looking for! Thanks for the suggestion, i need to hit the library or just order it if i can Charles ill definitely keep that in mind, the internet can be a difficult place to navigate and i definitely need all the advice i can get to make it a bit easier! Thanks for the link John there's some awesome stuff there Frosty, yeah the basic lamp is extremely old and so far as I've seen there's dozens of different forms in every culture. i remember seeing ones made of pottery at some point which were smaller than i expected but short of that I've never seen one in person. betty lamps as i understand are an improved design over the previous form. the simple oil lamp was like a lead ladle with a small point that held the wick and a basin for the fuel whereas the betty lamp had a small strip of metal under the wick that heated the oil a bit more effectively as well as a hinged cover to keep the oil from splashing around so much. Actually i believe "betty"is a corruption of the german word "besse" meaning better. That's about the extent of my knowledge on the subject though at the moment. And I'm glad i could stimulate some ideas! Excuse the less than fantastic picture quality, my camera isn't working at the moment so i took the pics from my phone I had made a fully forged spatula a while back from scraps and that made me want to take it a step further and go all out on another! That's how this one came about The handle started out as a piece of 1/4 x 3/4 mild steel and the blade was a scrap of old lawnmower blade i think, forged out thin on the power hammer. Its about 19" overall and the whole front face is filed bright and the necking has a bit of filework for an accent. There's also some accent lines across the handle but i don't know if the pictures make it visible or not. was really a pleasure to do something bright and shiny for a change! this latch was forged as a replacement for the outside of my parents general store, because the delivery truck guy broke the old cast iron one off with his hand cart! it was forged from a 7'' cutoff of 3/8'' x 1 1/4'' mild steel, the cusps were forged then the handle bent before the whole was filed smooth and the center accent cleaned up and punched with the roman numerals for the year. (i didn't have 1/4 inch number stamps only letters) the thumb piece was forged from a 2.5'' piece of 3/8' square scrap (found it on the shop floor! ) the "ears" that the thumb piece pivots on, have two 1/8'' tenons on each that fit into holes drilled close to the slot and riveted into deep countersinks this is somewhat of an odd latch in that the inside is a basic brass knob and deadbolt but the outside requires a stub about 1.5'' long to project into it and press a latch member which moves the bolt. i wish i had a pic of the back so you could see it but i kind of had to rush and finish it so the door could be used. its been a while since ive posted anything so i figured id post a few things to catch up! so here we have a set of calipers forged from 1/2 x 3/16'' mild steel, with forged rams head wingnut and 1/4'' forged bolt the hand vice is made from 1/2'' mild steel, upset and flattened to form the hinges and upset and forged to a T shape in the vice for the jaws. holes for the 5/16'' carriage bolt were punched and a wingnut was forged out of a scrap of 1/2'' round bar. finally a spring was cut from pallet strapping and riveted in place before the joint rivet was set. 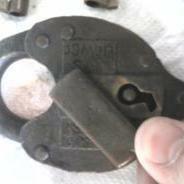 it measures about 8'' tall with 1'' wide jaws and really does a fine job of holding fine work for filing, buffing, etc. figured id make a post to show my swageblock that a friend of mine at the nearby foundry cast for me in trade for a big forged spatula. i made the pattern from pine, shaped with gouges, drills, and saws then sanded and varnished before i gave it to him to pour. you can see it has no through holes, that's because that would have required making special cores and he said to just keep it solid so i filled the sides with various depressions. it has deep and shallow bowls, a spoon bowl, rounds from 3/4 - 2", V's from 1/2'' - 1 1/2", a shallow swail on one end (which i find i use rather often), a shovel form on the face that has a cut in the end opposite the swail with a bevel the same as the shovel sides, the face has a 3/4 hole 3/4" deep and 1" hole 1" deep (for upsetting bars into), and finally, some rivet head divets so i can use the block as a backer for heading rivets. if i were to do it again, id have switched the order of the half rounds so that the small ones ended on the opposite side, and didn't leave that narrow ear, I'm afraid it may break off in the future i would have simply had another cast with a whole different set of things on it, but unfortunately the foundry was shut down about two months after this was made the weight is about 80# and if I remember correctly, its dimensions are 20"x4"x8"
no, didn't burn any scrolls, and the mark on the chest is my touchmark, hard to tell because the lighting is so terrible. I am pretty sure they don't make ancient hebrew letter stamps any way. :blink: I actually ended up giving it away to a friend of mine in trade for some kaowool and other gas forge supplies.